You ask, who are they, where can I find them? Well, allow us to introduce you to the 37 million African-American consumers* in the United States. African-Americans purchase autos, entertainment, electronics, houses, insurance, household goods, travel, cosmetics, and much more. Would you like to reach this market? Trice Edney Communications, LLC has recently launched BlackPressAds. This aspect of TEC provides an opportunity for corporate advertisers to expand your marketing outreach to masses of African-American consumers. 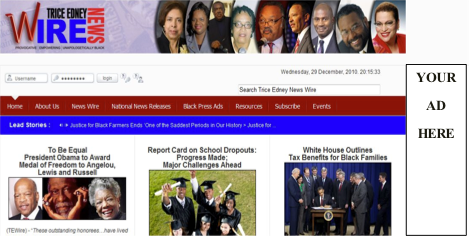 African-Americans across the nation are welcoming the emergence of Trice Edney News Wire with enthusiasm as viable web-based news service that is “Provocative, Empowering and Unapologetically Black”. Trice Edney News Wire is proud to unveil BlackPressAds Web Ads. • Align your 2011 marketing strategy to maximize outreach. Coming soon in 2011 -- Advertising placement service with Black Press newspapers.